Clearon Digital Hearing Amplifier - Behind the Ear - New No Receiver Design - Tiny and Invisible - Customer Review: Better than the fancy $3,000 model by Clearon at SFCPA. Hurry! Limited time offer. Offer valid only while supplies last. The sound level and amplification program is adjustable via a single switch. No need to fiddle with putting complicated devices together. The sound level and amplification program is adjustable via a single switch. No need to fiddle with putting complicated devices together. NOTE This product is not designed to be the most POWERFUL hearing amplifier you can find on the market. By design this product emphasizes CLEAR and SMALL instead of LOUD and POWERFUL. With a modest 36db acoustic gain, it also helps to prevent accidental hearing injury. Simple one switch operation - no press and hold - easily change the volume and frequency program with one finger to comfortably adapt to different listening environments. 100% customer satisfaction: if you aren't completely satisfied with your CLEARON hearing amplifier, simply return your hearing amplifier within the first 30 days for a FULL REFUND. If you have any questions about this product by Clearon, contact us by completing and submitting the form below. If you are looking for a specif part number, please include it with your message. Digital Hearing Amplifiers Qty 2 ( Modern Blue ) 500hr Battery by Britzgo BHA-220D - 1 Year Warranty!! 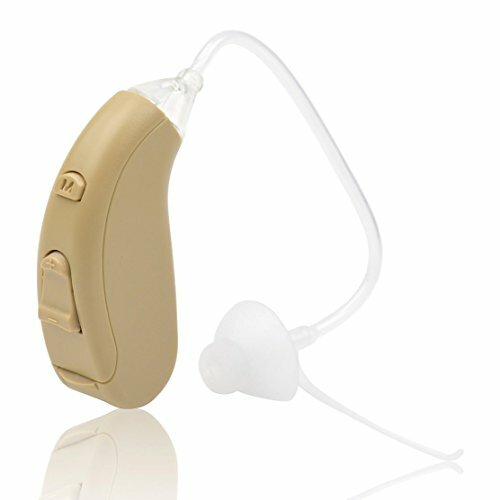 Clearon Rechargable Hearing Amplifier CL-202S/FDA Approved High Quality Digital BTE Small Size.